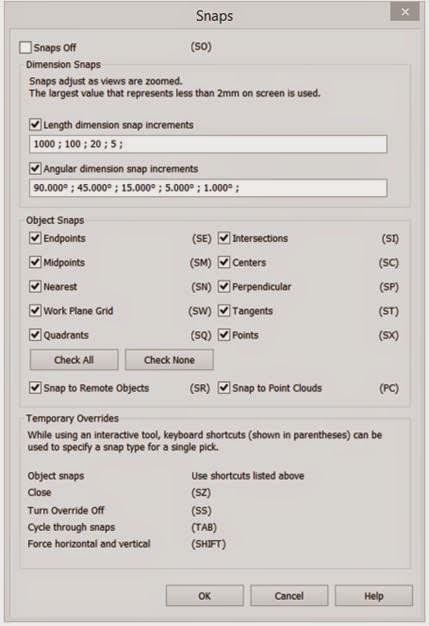 When creating or editing objects within Revit, the snaps are selected automatically. This is because they are pre-set in the snaps dialogue box accessed from the settings panel on the manage tab. Once selected the snaps dialogue box appears (as shown below) and all the snaps are on as default. However when creating or editing objects to get the snap you need to pick the appropiate featurre is often difficult because of all the snaps being on the wrong one is often displayed. One solution is to keep pressing and releasing the tab key which will cycle through the different applicable snaps. Unfortunately this is time consuming and the snap you require is not always displayed. A much simpler method is to type the keyboard shortcut for the snap you require and only that one will appear, thus making selection quicker. Your next question is “Where do I find the Keyboard shortcuts for the snaps?” If you looked carefully they are displayed in the snaps dialogue box I showed ealier. They are written in the brackets across from the snap option.